Ingredients to create a healthy, simple, homemade colon cleansing diet can be found in your kitchen or grocery store. Embark on this diet only if you're generally healthy; pregnant women, women who are breastfeeding, or anyone with serious medical conditions should consult a physician before starting this or any other diet. Nearly a century ago, Dr. John Harvey Kellogg said, "90% of diseases are due to the improper functioning of the colon." Holistic health practitioners often think of cleansing the colon as a cornerstone of holistic health. By ridding the body of excess waste, and helping the colon to function more effectively at ridding toxins from the body, you will rejuvenate the entire system. A homemade colon cleansing diet involves simple changes of diet that help the colon rid itself of excess waste. Many people eating the common SAD (Standard American Diet) do not consume enough fiber to adequately evacuate the wastes of digestion. The result is constipation, incomplete evacuation of waste products, and stagnation within the digestive system. A homemade colon cleansing diet aids in the complete evacuation of the colon in a safe, natural way. The colon, or large intestine, is probably the most undervalued organ in the human body. Measuring 1.5 meters in length, the colon's primary job is to store and remove wastes from the body and maintain the water balance. It also absorbs some vitamins, including vitamin K.Because most people eat a low fiber diet full of processed foods, constipation, gas and bloating are common. Eating a high fiber diet full of fresh fruits, vegetables, whole grains and legumes can often improve digestion and elimination. Colon cleansing takes this to a new level by fully evacuating the colon and improving the elimination of harmful wastes and toxins. The purpose of any colon cleansing system is to aid the body in completely evacuating the contents of the colon. To do this, you'll need to gently add high fiber foods to the diet. During this diet, be sure to drink as much clean, fresh, pure water as possible to move waste products easily through the colon. If you have any serious medical conditions, be sure to consult your physician before starting on any cleansing program. Do not embark on this plan if you are pregnant or breastfeeding. Use only organic foods during a cleansing diet. Drink as much water as you can, but no less than 8-10 glasses per day and a large glass of water with psyllium products. Do not stay on a colon cleansing diet for more than three consecutive days. Choose a time when you can rest at home, and not worry about needing a bathroom at inconvenient moments! Fresh, filtered water - Use a filtration system on your tap water or a filtering water pitcher for convenience. High fiber fruits - Organic fruits are best. Choose fruits you enjoy. Grapefruit, oranges, berries, and apples are excellent, fiber-full choices. Vegetables - Choose only organic vegetables. Eat vegetables raw or cooked. Broccoli, cabbage, lettuces of all kinds, squashes, zucchini, and most vegetables can work well on a colon cleaning diet. Supplements - Psyllium supplements may be found at health food stores, pharmacies, and natural health stores. Derived from husks of Plantago ovata, a grain, psyllium is a major ingredient in products like Metamucil. Psyllium contains soluble fiber, which increases stool bulk, and whisks matter from the colon. Take with plenty of water. Find psyllium in products that mix with water or are taken in tablets. This diet sample may be modified into a full juice fast by simply changing whole fruits to juices at each meal. For example, substitute the breakfast meal of whole fruit with organic, fresh-squeezed juices. Large salad of raw vegetables. Only use olive oil and vinegar, or plain vinegar, as dressing. Lemon juice may also be used as desired. Do not use any commercial salad dressings, even organic ones. 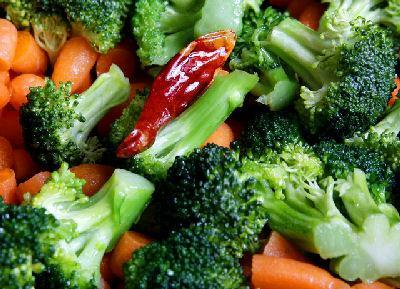 Steamed, cooked vegetables. Do not microwave vegetables. Eat as much as desired. Dress only with lemon juice or vinegar. Water: Drink at least a quart of filtered water (more with psyllium). Enjoy this simple, easy diet and the benefits of good health, glowing skin, and renewed energy.